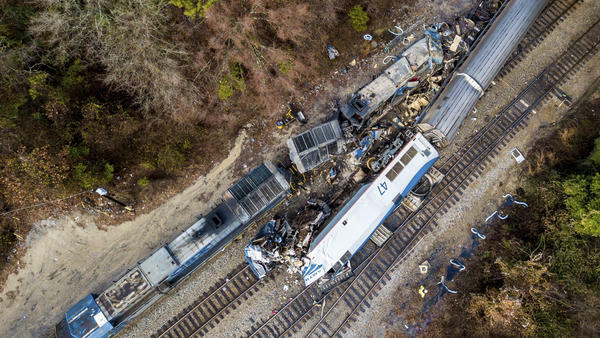 An aerial view of the site in Cayce, S.C., where an Amtrak passenger train (bottom right) slammed into a CSX freight train early Sunday morning. At least two Amtrak crew members were killed and more than 100 people injured, authorities said. NTSB investigators say it appears a CSX freight railroad crew failed to flip a switch back to the mainline setting after pulling its freight train onto the side track. NTSB Chairman Robert Sumwalt says the switch was still locked into a position diverting train traffic from the mainline to the siding, steering the Amtrak train onto the side track at about 56 mph, where it slammed into the parked freight train. The crash killed the Amtrak train's engineer and a conductor. More than 100 other passengers and crew members were transported to hospitals, most with minor injuries, though authorities say eight still remained hospitalized as of midday Monday. Sumwalt says that after pulling their train off the mainline and onto the siding, the CSX crew members should have relined that switch to the main track — and that they had reported doing so. "They had already, in fact, released their authority back to the dispatcher," said Sumwalt at a media briefing Monday near the scene of the train crash. "They had already said, 'We're through,' which would indicate that they've done everything they need to do." But he says the switch still was padlocked into the position of steering trains into the siding. Meanwhile, Sumwalt said, the trackside signaling system in the area — which would have alerted the engineer to the position of the switch — was inoperative: "It's our understanding that they were doing upgrades to the signal system to get it ready for positive train control." When signals are out, Sumwalt says, the railroad usually would operate under a system of track warrants, with the dispatcher authorizing the train to operate in a certain area. Whether that was happening Sunday morning is not yet clear. The head of Amtrak wasted no time in placing the blame on CSX, which owns, operates and controls the tracks Amtrak uses in the area. Reuters reports that in an email message to staff Sunday night, Amtrak President and CEO Richard Anderson said the passenger train was "on the track as dispatched by CSX, the host railroad ... our crew on 91 was cleared to proceed by CSX dispatch, but CSX had lined and padlocked the switch off the mainline to the siding, causing the collision." Regardless of why the train was switched onto the wrong track, railroad experts and train crash investigators say positive train control — the system CSX was working to install in its signaling system at the time of the crash — would very likely have prevented the fatal crash. Positive train control uses GPS, wireless radio signals and onboard computers to track exactly where trains are and will automatically slow down or stop trains if they're going too fast or nearing a collision with another train. Essentially, the system overrides human error, taking over if the engineer misses a slow or stop signal or is otherwise distracted. "An operational PTC system is designed to prevent this kind of accident," Sumwalt said Sunday. Railroads are facing a deadline at the end of this year to fully install the technology. A decade ago, Congress mandated the systems be used on passenger and freight railroads nationwide after a commuter train in Los Angeles slammed into a freight train in 2008, killing 25 people. The railroads initially were given until 2015 to develop and implement the safety system, but many of them balked at the cost and complexity of creating it. When it became clear that few, if any, could meet that date, Congress pushed the deadline back to the end of 2018 for installing equipment trackside and on locomotives and until 2020 for implementation for some railroads. Amtrak and commuter railroads have had a particularly tough time securing the funding needed to develop and purchase the equipment, radio frequency bandwith, and technology required for positive train control. And because Amtrak runs its trains on freight railroad tracks across much of the country, its system has to be able to communicate with all of those companies' systems. So Amtrak can make progress only as fast as the freight lines do. On a conference call with reporters, Anderson said Sunday's crash underscores the importance of meeting the year-end deadline for widespread implementation of PTC. But The Associated Press reports that Anderson also acknowledged that the biggest impediment is that private companies must work together to put the technology in place. Safety advocates and regulators have accused the railroads of dragging their feet in implementing positive train control, pointing out that the technology has been around for decades. Among them are some members of Congress. Sen. Richard Blumenthal, D-Conn., said Sunday that "inaction is inexcusable." Rep. Sean Patrick Maloney, D-N.Y., added Monday that "time's up" on delays and that 2018 "has to be a hard, legal deadline for all passenger railroads to implement PTC." In November, at an NTSB meeting to announce the results of the investigation into a fatal Amtrak crash outside Philadelphia in April 2016, Sumwalt blasted the railroad for its "lax" attitude, saying "Amtrak's safety culture is failing, and is primed to fail again." That warning seems prophetic now, as there have been four deadly Amtrak accidents in less than two months' time. On Jan. 31 an Amtrak train carrying Republican members of Congress to a retreat in West Virginia hit a garbage truck at a crossing near Charlottesville, Va., killing one person on the truck. A North Carolina couple was killed Jan. 14 when their SUV was hit by an Amtrak train; police say it appeared the driver of the SUV tried to go around lowered crossing gates. And on Dec. 16 an Amtrak train making its inaugural run down a new route between Seattle and Portland derailed as it entered a curve on a highway overpass, speeding along at more than 50 mph above the posted limit. The engineer in that crash says he did not see a key milepost or a signal warning to reduce speed in the minutes leading up to the crash. But Sumwalt warns against connecting all the accidents — which all appear to have different causes — to the failing safety culture he pointed to in the 2015 crash. For example, two of the recent crashes may have been caused by drivers trying to cross tracks when they shouldn't have. "It's very important that we have to look at each of these accidents in isolation to be able to determine if there are systemic issues," said Sumwalt at Monday's briefing. "Are we willing to say that there's a systemic issue with Amtrak? No, we're not."